Some of my friends don't like to be reminded of their birthday. They don't want a fuss. They dread any sort of celebration. Not me. 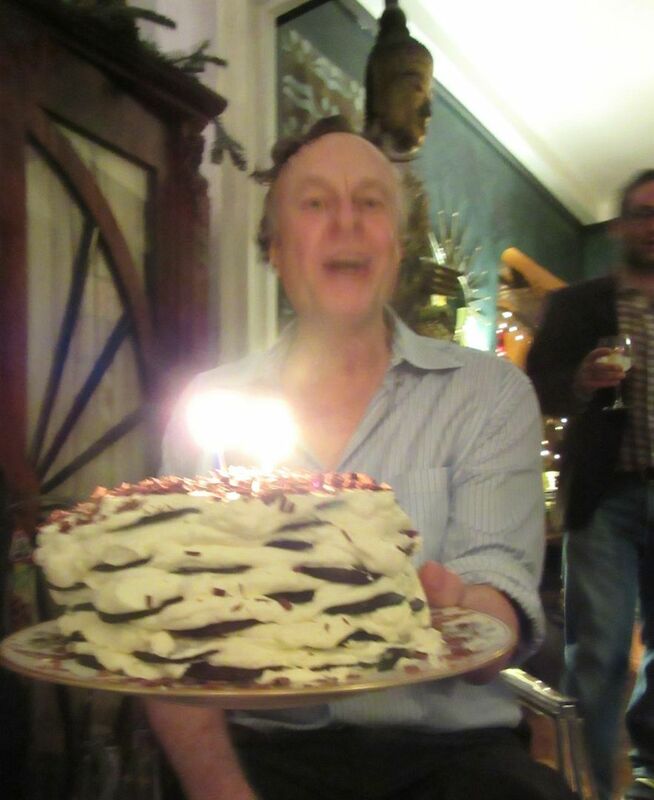 Last year I had two birthday cakes. This year I had two birthday parties. I think my excessive attachment to my birthday has to do with being born December 22nd, three days before Christmas. My parents seemed to sense I would not adjust well to being overlooked in the holiday crush. I didn't have to walk around with a rhinestone tiara on my head. They got it. In my dad's home movies, there I am cutting the cake, listening to the music box baked inside, laughing or crying. Poor Mom. I wasn't an easy-going child. There is a certain crowd of regulars who have often come to my smallish potluck birthdays in recent years. In December my friend Chantal proposed to invite them to her new upper west side apartment and cook herself. Eileen baked fabulous mac'n'cheese. Zarela Martinez brought her luscious frozen lemon torte. Across town, my friends Belle and Peter agreed to host a potluck buffet with some of my newer friends two nights later. Rina Oh appointed herself casting dictator. I tried not to be too bossy myself. But I'm sure I said "no kale." Rina brought Korean rice cakes. Josh's p�t� en cro�te with apricot came from Epicerie Boulud. I do appreciate a man who knows where to shop. Bob Grimes came with a version of his indecently rich spinach casserole. 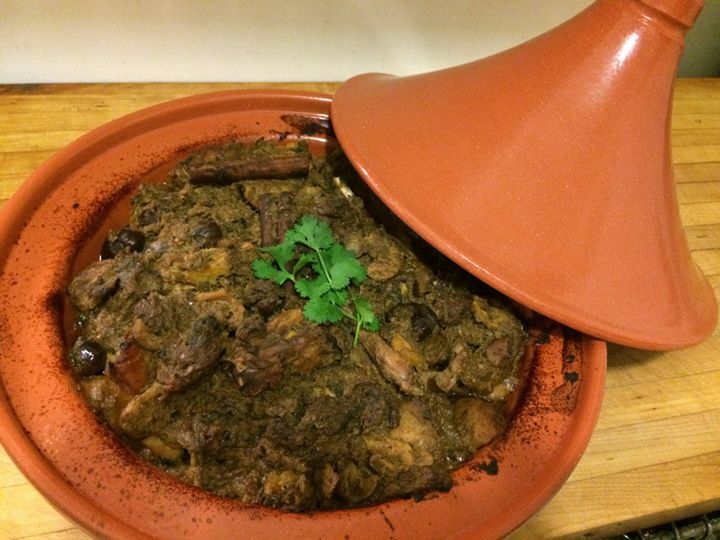 Rich, our ethnic junkie did a rabbit tagine with persimmons and exquisitely delicate couscous alongside. He is famous for his Christmas cookies. I wish I'd filled my purse with the leftovers. Lauren Bloomberg brought two huge sheet pans of macaroni and cheese, using my own recipe from my memoir Insatiable. I had tested it, of course, but still - I was wildly relieved to see that it worked. It a crusty, stick to the pan prototype. Here's a link to the recipe: "Almost Like Mom's Macaroni and Cheese." At my request Peter did the Classic Ice Box Cake from the 70s. I've tacked the recipe at the end of this column. 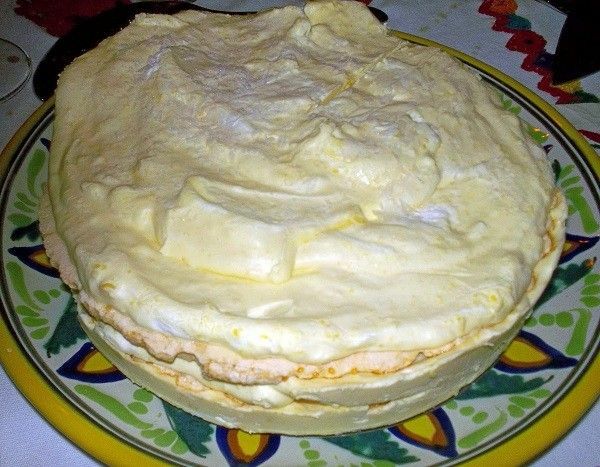 You'll also find a recipe for Zarela's luscious Frozen Lemon Torte by clicking here. Chantal doesn't use recipes, but she was happy to reveal that the secret of her apple tarte tatin is using an old-fashioned iron skillet. 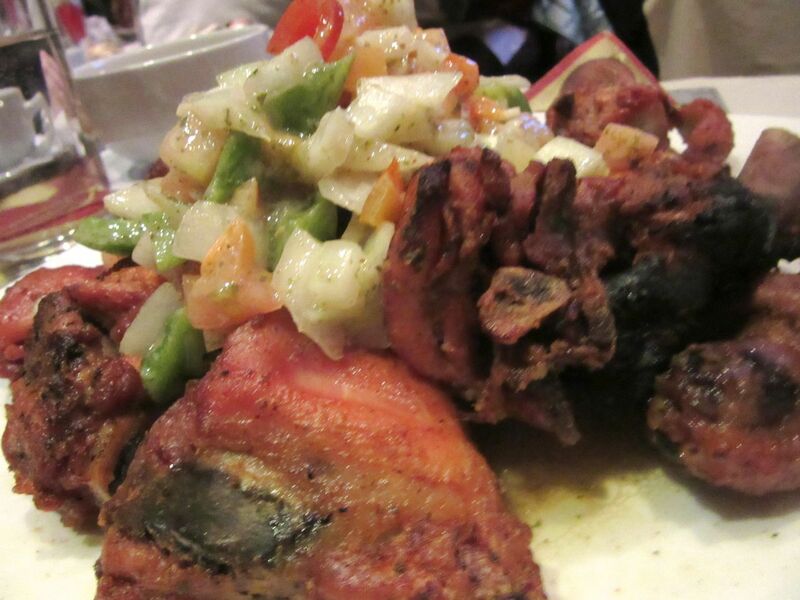 Early dispatches from La Savane suggested it wasn't easy to access its exotic charms if you didn't speak French, given the lack of menus. That made it even more enticing when a friend suggested we go. She was motivated by that week's enthusiasm in the New Yorker. Opened by a couple of taxi drivers, one from the Ivory Coast and the other Senegalese, the notice reported. We entered through the canvas chill-guard, saying hello to a woman waiting inside with a child in a stroller. The room seemed small and shadowed with a counter at the far end, murals of African villages on the walls, strings of Christmas lights, and the gurgle of a fountain. A waitress led us to a table covered with patterned paper. Given the glow cast by the New Yorker, I was not surprised to see a scattering of white faces chowing down in a constant to-and-fro of locals and Africans, many of whom seemed not surprised at all to run into each other. Our server helped us navigate the not-very-helpful menus. 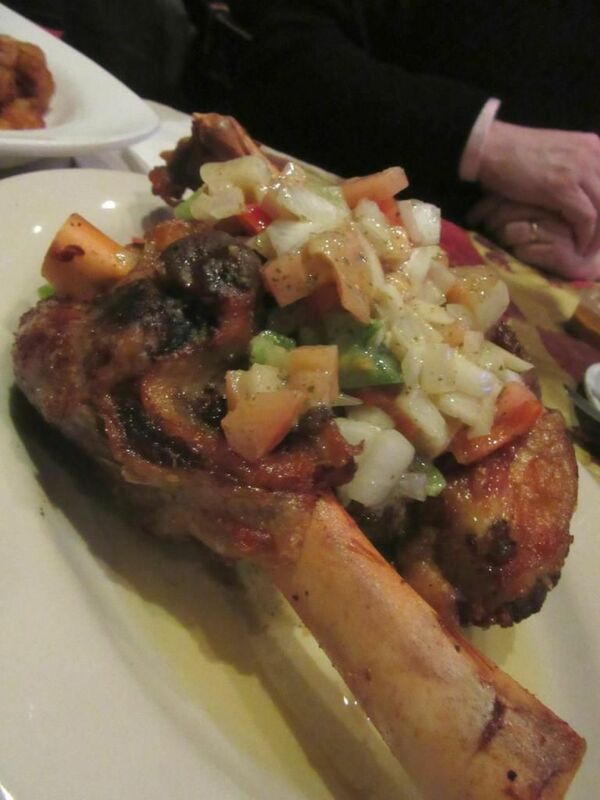 We shared a crispy fish and a generous portion of lamb shanks -- both topped with a deliciously mustardy vegetable mix. For a guide to the mysteries of the Ivory Coast and Senegal click here. 239 West 116th Street. 646 490 4644. I dropped into The Arlington Club early one Monday evening. 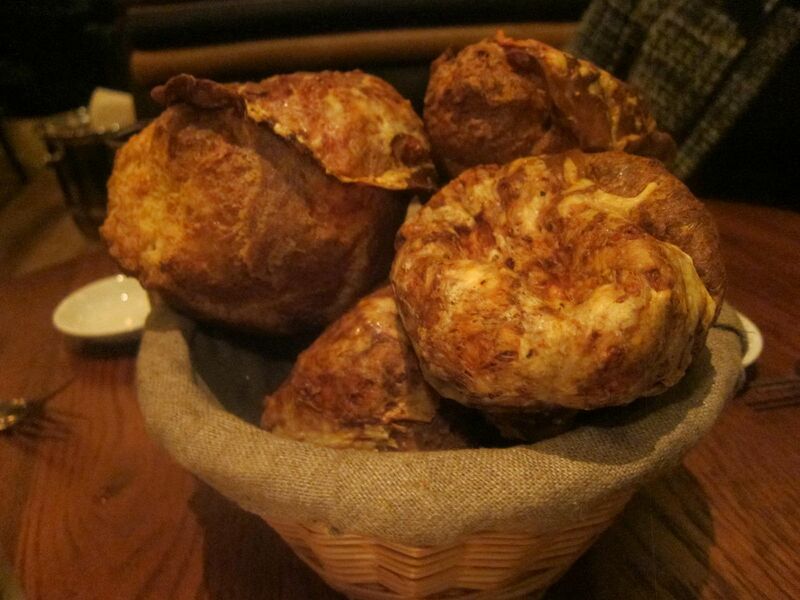 The famous popovers, bigger than a newborn's head, seemed shrunken. I got the feeling Chef Laurent Tourondel wasn't there - normally he would have sent out a huge platter of sushi or some extra sides if he noticed me. Sure enough, I discovered he'd left the club's kitchen a year ago and is off putting together a wood oven pizza-pasta concept for the Eventi Hotel on Sixth Avenue. (Remember Bar Basque?) "But he's still our partner," the Tao Group tells me - a reminder to Laurent lest he forget in his new obsession with Italian. "If we need him in the kitchen at Arlington, we just have to call." Click here for more on the flights of Laurent. 1031 Lexington Avenue. 212 776 4921. I was as excited as any other needy, not-totally-fulfilled Upper West Sider, when the Torrisi-Carbone boys cloned a pumped-up Columbus Avenue version of their small, wildly-venerated, pocket-size red sauce joint Parm on Mulberry Street. I'm not sure why I was so thrilled. I'd gone to the Village spot with a friend and had been less than impressed with the old-fashioned ziti and an order of eggplant parmigiana. All very primitive, reminiscent of Little Italy. Good if you wanted a taste of childhood. And maybe that was the point. True the neighborhood is now blessed with a more spacious off-shoot of Red Farm and we have Bustan's lure and the very good food at Awadh. Still, relaxed Italian is always welcome. Local hopefuls milled about in the area between the bar and the hostess stand, adding their names to the waitlist as we checked in. Did I hear her say something about 90 minutes? It got even more ja mmed and noisy as time ticked on. Were they first-timers like us, or recidivists, already hooked on the very good garlic bread with rubbery just-made mozzarella and the $17 monolithic ziti with gravy? Knowing that gravy is Mulberry Street for meat sauce, I ordered it "on the side." A lagniappe of longtime eating out in New York is that you learn the language. You know that an egg cream is made without egg and without cream. You appreciate that "Sunday sauce" is red and loaded with animal parts. You understand that B&T is not bacon and tomato but bridge and tunnel. I'm not sure if our waiter was doing Parm schtick or his own, but wh en we ordered a drink, he announced like a sideshow barker that Parm did the best drinks in the neighborhood. My few ounces of gingered booze on packed ice was not exactly rousing and my companion's green nectar tasted like cough medicine. (Point for Jeremy. He took her drink off the bill). 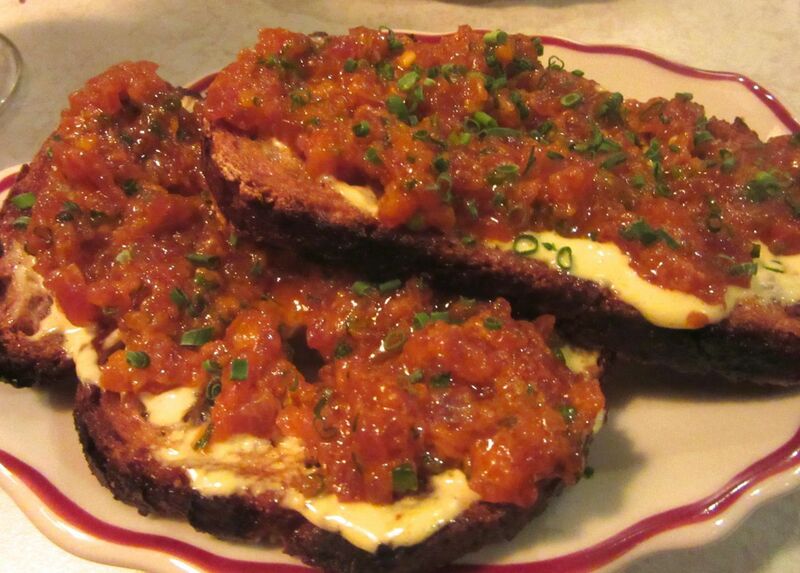 Very good spicy tuna bruschetta is not what you look for in a place called Parm. That was a surpirse. 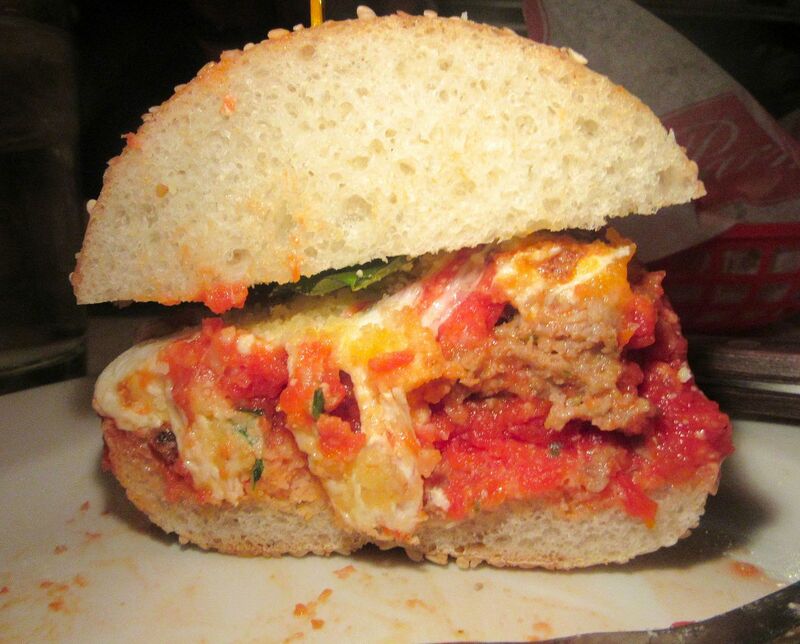 What you might anticipate is a very good meatball parm hero. Well, maybe not on a seriously good bun. Perhaps grilling the bread would help. Parm uptown bows to a new emphasis on vegetables, 3 for $15. The string beans oreganata were perfectly cook ed. 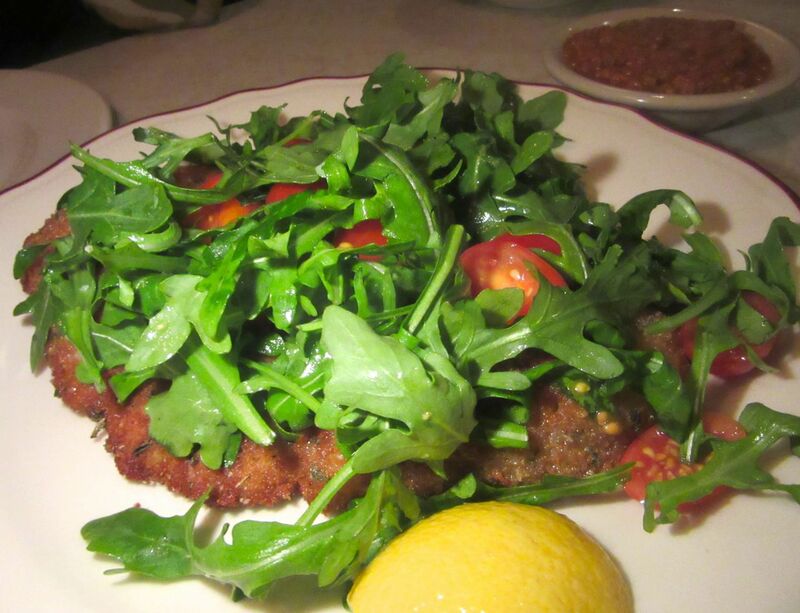 At $26 you have reason to hope for the pork Milanese under its scattering of arugula and grape tomato. Granted, not bad. 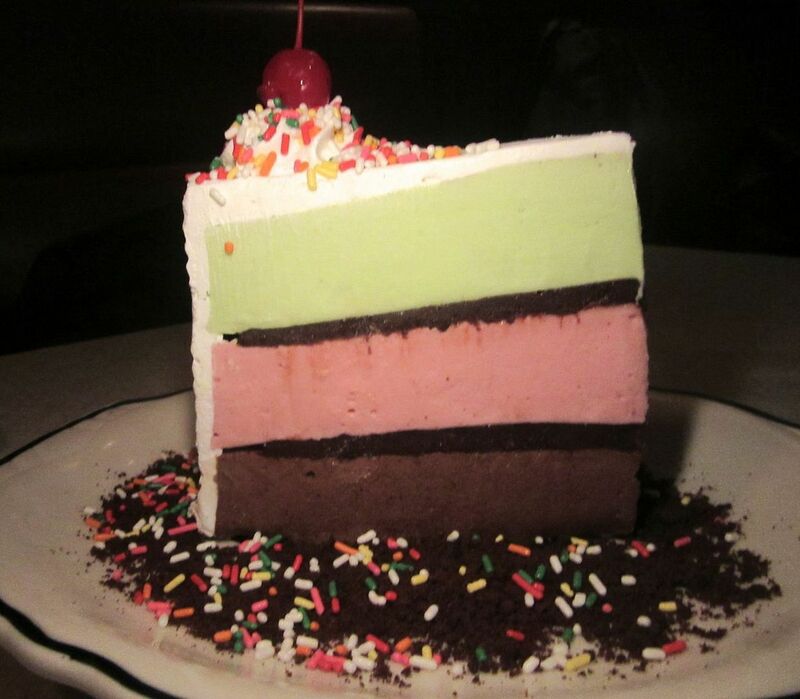 The classic pink, white and green ice cream cake is so beautiful, you'll forgive a certain lack of personality. I was embarrassed to make my pals pay $70 each for a meatball sandwich. So I picked up the check, $210 with tip. From the grinning faces and rapacious flailing of the crowd around us, I'd say Parm has a solid neighborhood future. 235 Columbus Avenue between 70th and 71st Streets. 212 776 4921. Spread a thin layer of cream on a round plate. 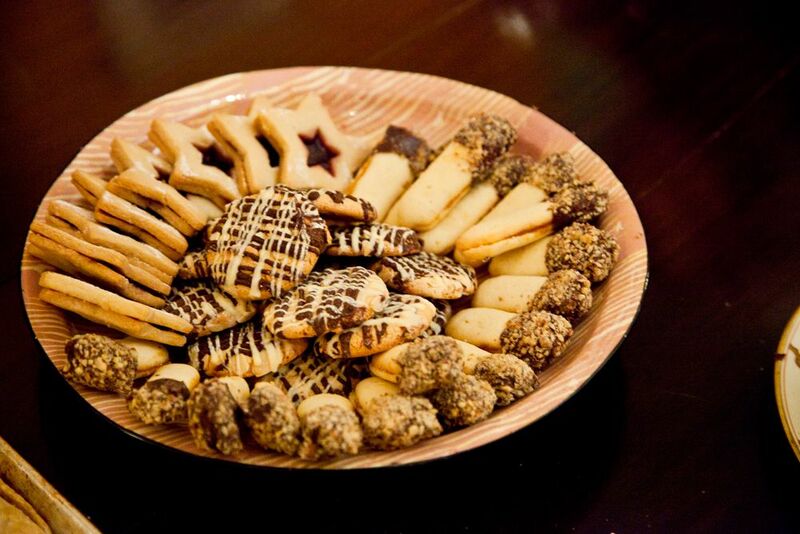 Place one cookie in center and surround with 6 more cookies. Spread a nice amount of cream on the cookies and continue to layer both cookies and cream, making sure to stagger cookies in each layer. Cookie edge should be visble on the side of cake. Finally, spread a good coat of cream on top and shave dark chocolate on top. Refrigerate for 10 hours. Serves a crowd. Photographs of The Classic Ice Box Cake, the Ethnic Junky's remarkable cookies and rabbit tagine, Zarela's Frozen Lemon Torte, the fried chicken and lamb shanks at La Savane, the original plump popovers at The Arlington Club, and Parm UWS's meatball hero, pork Milanese, tuna bruschetta, and classic ice cream cake. may not be used without permission from Gael Greene. All rights reserved.